Slots enthusiasts have all the reasons in the world to not miss betting on Bitcoin slots offered in Ritzgrand Casino. After all, this online gambling site has an array of slots games that are equipped with exciting and exceptional features guaranteed to make slots betting more fun, exciting, and rewarding. Therefore, make sure to experience spinning the reels of the slots games available here to get a taste of the engaging gameplays and top features the casino’s slots boast of. However, if asked about the downside of playing slots in this casino, it would have to be the fact that there are only seven Bitcoin slots present, six of which are five-reel slots and one three-reel slots. Although the total number may be a dismal as compared to the collection of slots games offered by other Bitcoin-powered casinos, it is still remarkable that these Ritzgrand Casino slots games are packed with great features that make up for the casino’s lack of slots. Meanwhile, when it comes to the graphics department, it becomes evident that the Bitcoin slots in this gambling site have done an exceptional job. At a glance, players will notice the rich and vibrant colors used in each game. Begin wagering on any of these slots and discover the attractive themes complete with quality graphics and animations. While these are far from delivering visual pleasure created by 3D slots, they fare better than most of the slots games available in Bitcoin casinos online. The overall slots casino betting experience offered by Ritzgrand Casino should be commendable; thanks to the addition of the various in-game features and surprises that keep the games more thrilling and entertaining. Find in the games an array of special symbols like Wilds and Scatters that ensure that every spin of the reels will likely result in a payout. That is why those slots bettors who prefer to boost their bankroll effortlessly should simply place a bet on any of these slots and hope that their luck will bring them closer to winning massive payouts. What makes betting on slots with bitcoins in this casino much better is that all slots require only 0.01 BTC as its minimum bet. Therefore, slots games fans with small bankrolls can conveniently join in on the fun without having to worry about wagering higher bets. If lucky enough, there is even a chance to hit larger winnings even in just one spin. 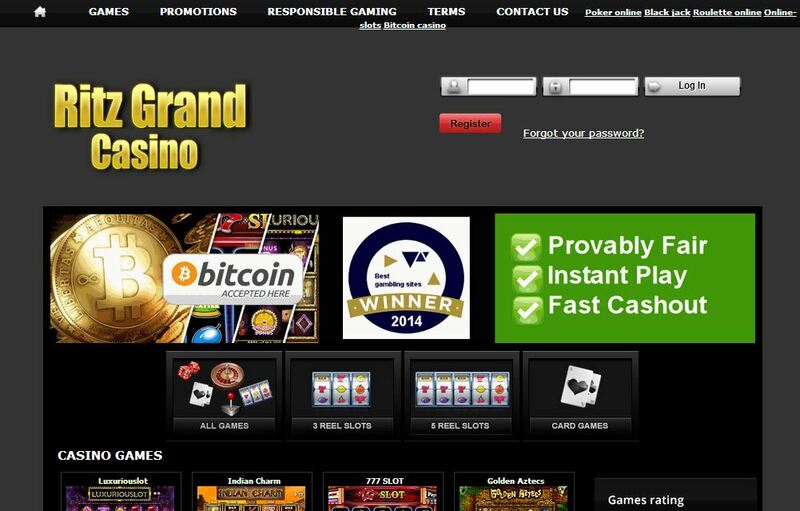 While Ritzgrand Casino is not the most perfect Bitcoin casino for all the avid bettors to play slots games in, this gambling site is more than capable of providing worthwhile betting experience through its games filled with excitement and enjoyment. Indeed, spin the reels of the slots in this casino, play Bitcoin slots, and witness whether or not the games will perfectly compliment your betting style.